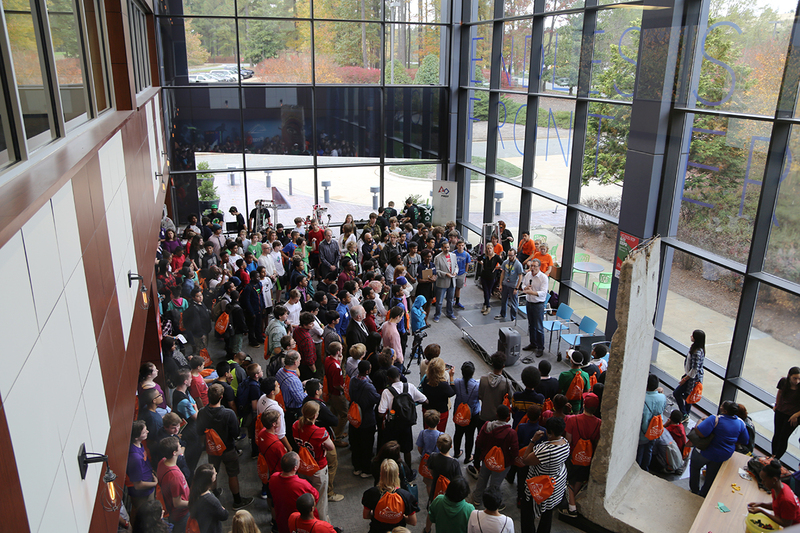 About 300 Wake and Durham counties students flooded RTP’s Frontier to attend the first Gaming & IT Expo for US2020 RTP sponsored by Fidelity Investments, Red Hat and IBM. The event was a mash-up of science camp, college fair and professional conference. US2020 RTP is a STEM mentoring program sponsored by the Research Triangle Foundation of NC. US2020, the national organization, was developed from a White House call to generate large-scale, innovative solutions to science, technology, engineering, and math (STEM) education challenges. “We want your imagination to be limitless,” said Research Triangle Foundation CEO Bob Geolas encouraging the crowd of excited boys and girls to investigate and ask questions of STEM professionals and educators. Durham residents Toya Merritt and her daughter, Faith Merritt checked out the half-day event. “I wanted her to explore the different career opportunities in STEM. She needs to touch it, feel it and see it. I want her to do something she enjoys,” said Toya Merritt, a business analyst for the City of Durham. Students experienced firsthand how the hobbies and technologies they utilize each day could lead to promising careers. The Merritts spent time talking with representatives from RTP companies such as IBM about cloud storage technology and a Medical Minecraft game. Joseph N. Kozhaya, a senior software engineer, explained to the Merritts how high school students designed a video game themed around infectious diseases and pharmacology. The game was designed to include virtual teams of players fighting infectious diseases inside a human body. Minecraft has gained traction as an educational tool for engaging students in STEM fields such as programming, video game design & development, level design, and problem solving. Admission advisors from North Carolina State University, the University of North Carolina at Chapel Hill, Wake Tech Community College, Durham Tech Community College and The Art Institute of Raleigh-Durham also attended the expo encouraging students to pursue higher education in the fields of game design, web design and information technology. At the 2013 White House Science Fair, President Barack Obama announced US2020’s mission is to dramatically scale the number of STEM professionals mentoring and teaching students through hands-on projects with a focus on serving underrepresented communities. Many of the Triangle students attending the gaming and IT expo are from demographics often disproportionately low to seeking careers in science, math and technology such as girls, Native American, Latinos, and African Americans. The students range from sixth through 12th graders. The digital natives had a good time, some showing off T-shirts that read “Talk Nerdy to Me,” and playing games on computer monitors or interacting with robots designed by NC FIRST Robotics, an organization that brings together student teams to learn about technological innovation through the use of robotics. Brianna Tamarez, an eighth grader, even received a summer internship offer from 3-C Institute for Social Development, the makers of Zoo U, an online game that assesses children’s social skills and provides an individualized learning experience based on that assessment. Tamarez isn’t sure exactly what she wants to do yet. She’s more interested in the arts and literature and gaming and programing is more of a hobby. But she’s hasn’t ruled out eventually combining arts and gaming. The 25 girls in the group were mainly seventh and eighth graders and a couple of sixth graders. Ward said the gathering felt like a business expo, giving hands on experience to the students. She appreciated the professionals talking about their products and how they’re going to be the wave of the future. Cheryl Thompson, web manager for the office of communications and public liaison for the National Institute of Environmental Health Sciences, was one of the panelists sharing her story about becoming an IT professional. “It’s important to talk to kids early on to open their eyes to many choices,” she said. Thompson has a bachelor’s in psychology and biology. “I wanted to be a medical doctor,” she says working on computers was a hobby. But she decided she rather turn that fun into a full-time occupation.